Before the ramp season completely plays out for 2011, here’s one more ramp-related post, this one on a noteworthy food-wine pairing. As a pungent spring green, ramps are often labelled, like asparagus and artichokes, as tricky to pair with wines. The stock solution for all three is usually an herbaceous, minerally Sauvignon Blanc from the Loire Valley or New Zealand. Depending on the preparation, this may well be. But, when cooked, ramps exclude a sweet earthiness, even a floral characteristic, that invites other vinous options, including reds. Grilled or sautéed ramps are delicious on their own. If, however, you use ramps as a flavoring component in a dish, like risotto, the creative wine-pairing possibilities multiply. In our recent ramps reverie, Kathryn was inspired to make home-made ramp ravioli, mixing garlic, ramps (cooked) and ricotta cheese for the filling. It was a ton of work, especially rolling out the dough (by hand), but well worth the effort, yielding several freezer bags full of tasty squares for future, easy access. As it happened, computer problems kept Kathryn city-bound this past weekend. Grudgingly, she agreed that I could pull out some ravioli from the freezer for dinner, in her absence. With visions of steaming ravioli on my plate, topped with a light tomato sauce, I went to Sipperly’s Grog Shoppe to contemplate a wine to match. The only wine shop in nearby Red Hook Village, Sipperly’s is a claustrophobic space, and chaotic in terms of display and organization of their largish selection. But they do have some hidden gems among the random bottles and stacked cases. 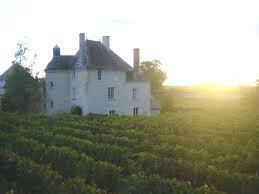 In their unmarked Rhone section, a Loire Valley red wine from Chinon, called “Rive Gauche”, caught my eye. Chinon reds are predominately made of Cabernet Franc (up to 10% can be Cabernet Sauvignon), medium-bodied, aromatic (on the herbal, leafy side) and food-friendly, capable of elegance. Hmmm…I liked the possibilities. And at $16, why not play a hunch? Fast forward to dinner. In addition to the Chinon, I had a bottle of the Louis Jadot 2009 Beaujolais Villages already open, a light, versatile Gamay-based red from a great vintage. Why not try both with the dish? Now, I’m a big fan of spinach and ricotta ravioli, but substituting ramps for the spinach puts it on a higher, more exciting flavor plane. The ramps’ assertive sweet earthiness beamed through in each bite, melding perfectly with the tomato sauce. And the wines? 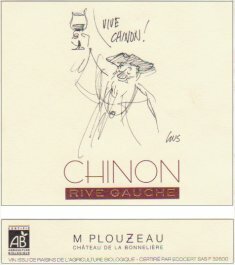 The 2009 “Rive Gauche” Chinon, from Marc Plouzeau’s Chateau de la Bonnelière, an organically produced wine, was full of Cab Franc character: earthy and herbal, with aromatic notes of tobacco, anise, menthol and jalapeno. Its medium body, vibrant acidity, briar fruit and soft tannins melded beautifully with the ravioli dish, matching the earthiness and pungency of the ramp filling, while harmonizing with the zesty tomato sauce. Not an easy pairing, but the Rive Gauche pulled it off with aplomb. On the other hand, the Beaujolais Villages, though nicely fruity, lacked the body and complexity to stand up to the dish. Chalk one up for Chinon. Rive Gauche and ramp ravioli? Absolumemt. This entry was posted in Home Cooking, Hudson Valley, Local Food, Wine, Wine + Food and tagged "Rive Gauche" 2009, Cabernet Franc, Chinon, Louis Jadot, Marc Plouzeau, ramp ravioli, ramps. Bookmark the permalink.